UCLG’s Learning Agenda has been enhanced since the adoption of UCLG’s strategy for the period of 2013 to 2016. One factor that all learning events have in common is that they contribute to a cohesive network. Peer learning is an investment in building trust and relationships by fostering dialogues and understanding between participants. As we move towards the implementation of the 2030 Agenda for Sustainable Development, the hands-on experience of UCLG’s members will be instrumental to achieving the goals set by the international community. 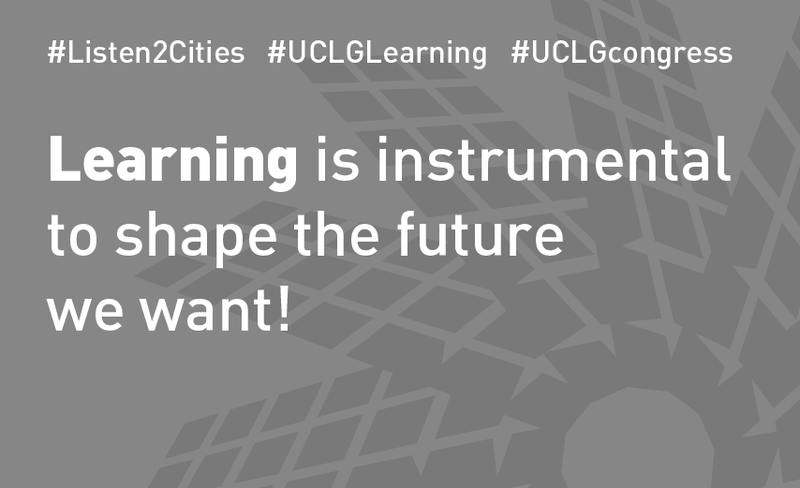 The UCLG Learning Agenda offers a space to test new ideas and methodologies and develop learning spheres and communities of practice to address the specific interests of our members. Maria Regina Rau de Souza, Technical Chair of the UCGL Committee on Urban Stretegic Planning, City of Porto Alegre. The UCLG Learning Agenda is demand driven, dynamic and based on practices and needs of our members. The Second Learning Forum, celebrated in September 2015, gathered active members to define the key criteria that guide new initiatives of the Learning Agenda. The Forum reiterated the need to reinforce the Learning Agenda by promoting decentralized cooperation, peer to peer ties, communities of practice and networks. The different elements that should be taken into consideration when shaping the Agenda were mapped out and included the need to ground it in reality and make it evidence based, while ensuring a flexible structure. The World Summit of Local and Regional Leaders (12 to 15 October 2016) will be the setting for the Third UCLG Learning Forum. We will centre our attention on the importance of learning within the UCLG Network. Along with the Learning Forum, diverse thematic learning session within the Summit will provide a modality for practical, forward-looking exchanges between members, partners and networks. The Learning Sessions aim to explore diverse learning methodologies that varied from more traditional workshops to small interactive sessions.